It’s just before midnight on our way home from the Des Moines Menace win at the US Open Cup game in Minnesota, basking in the late night glow of our road win. I was pretty sure I wasn’t going to make this trip. I missed the Menace home opener to a migraine, and yesterday, my day started with a 6 AM wakeup to 5 year old screaming in ear infection pain. Having already been though tubes with him, I sure as heck wasn’t going to OK a roadie to stand in the rain and get home at 1 AM not even 24 hours into antibiotics. But then…talking to my mother in law about the game, his illness, my general aggravation that my darling husband had just assumed he could take my car on this trip….she said, “Just bring him over here, we’ll watch him so you can go.” Dumbfounded, I said “No, really, I just wanted to vent, I’m OK with staying home with him.” To which, my amazing mother in law replied, “I know you really like going to these games, it’s OK, bring him.” Oh glorious, happy day of marrying so well, even your extended family is awesome. 1. My mother in law: Thank you Caryl, for making my supporter life meets mama world a tiny bit easier. 2. Lower League, part 1: One of my MLS friends posted on FB today that he was doing X while his MLS team was playing in Open Cup because “I’ll care about Open Cup when you do, [MLS Team Name].” That’s just lame. Every team should care about Open Cup….except you, Sporting…don’t you worry about our little PDL club. 3. Lower League, part 2: I used to wish that I could magically live in Des Moines AND have it be and MLS city. And I’ve had soccer-loving friends say they could never live in a city that’s lower league. But you know what? Lower league is awesome. We can walk up to our players after every game. Our owner and GM are accessible, and love the game in a way I don’t often see in the MLS. I especially loved watching our new GM Matt Homonoff at the game tonight, panic stricken look on his face, praying along with us for a Menace goal. I liked our previous GM, but I’m kinda crazy about this new guy. 4. The supporters: When my MIL offered to watch my sick kiddo, and I had to choose to go or no go, it wasn’t just the team I was excited to see. 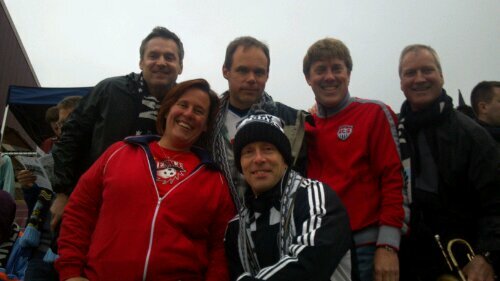 I wanted to go hang out with Minnesota United’s Dark Clouds Supporters Group. 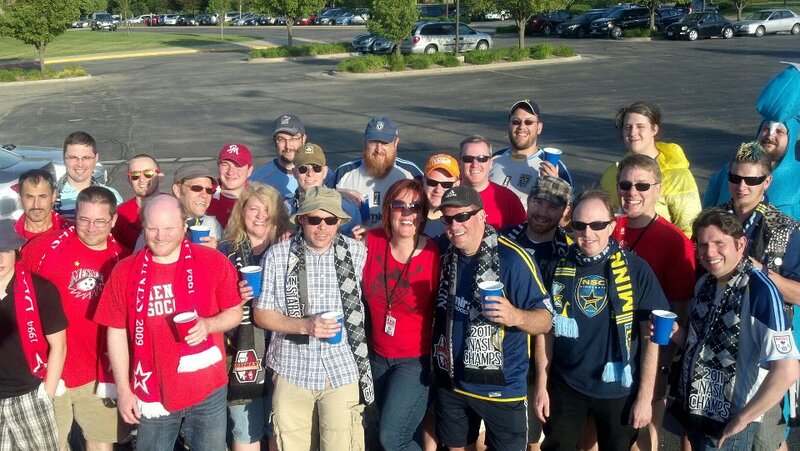 A few I’d met through crossover with Minnesota 1st Volunteers, the local USMNT supporters group, and others I met when we hosted the Open Cup last year and they road tripped to see us. It’s nice that outside of “those 90 minutes,” we’re all friends. That’s it. I’m completely excited about going to KC next week. Totally exhausted, but home safe. On to round 3!